RayKo Photo Center is pleased to announce the opening of our 2015 Fall artists-in-residence exhibitions. We've had two very talented female artists slaving away in our darkrooms for the past six months. Both Kathya Landeros and Kari Orvik have been hauling around large format cameras (8x10!) and making images of their communities. It goes beyond simple documentation and portraiture though, as their exhibitions will reveal. 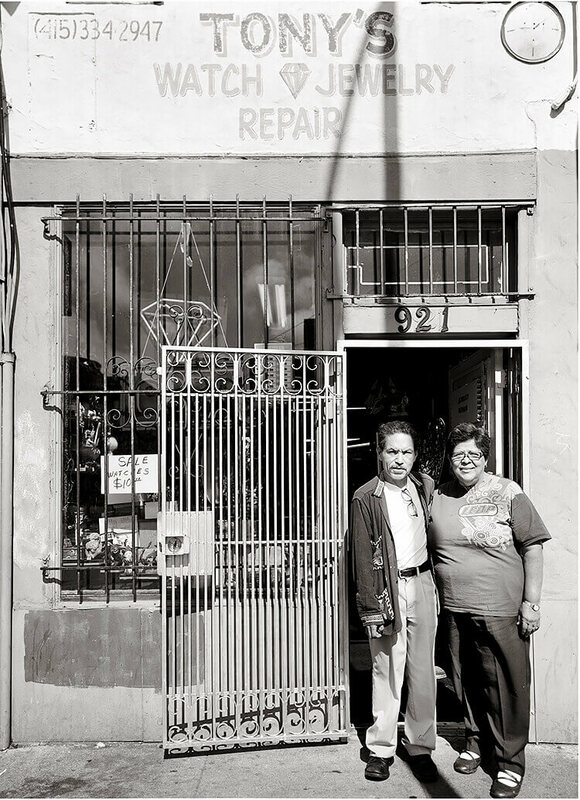 For more than a decade, Kathya Maria Landeros has worked on long-term personal projects documenting Latino communities throughout California's northern Central Valley and other parts of the American West. Within her family narrative there are many tales of hardworking kinfolk who emigrated from Mexico to the United States. It includes stories of her second great grandfather working in Arizona's mines; her grandfather who worked as a Bracero (a bilateral government sponsored agricultural work program); and her grandmother and parents who came to California and worked as farmhands. Landeros' family's legacy of migration has revealed to her the inextricable ties between the two countries and its people. As a Mexican-American, her work seeks to explore this history - and photography - as a means by which to differentiate the Latino immigrant experience from the divisiveness of borderlands, violence, and poverty. Landeros' current photographic work, Hombrecitos & Mujercitas, is a chapter of this ongoing work. It focuses on adolescent Latino youth located primarily in her hometown of Sacramento. Translated from Spanish, hombrecitos and mujercitas mean little men and little women. 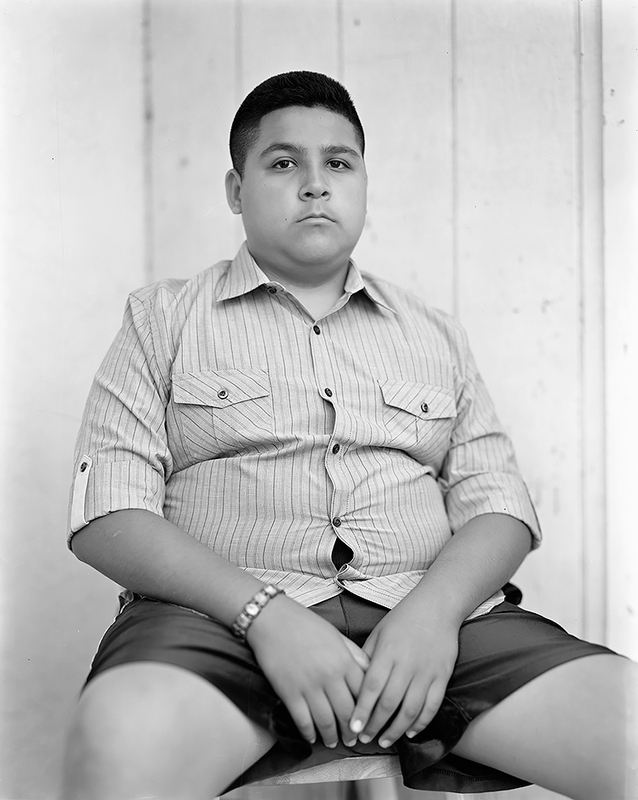 Using a large format camera, Landeros has made portraits of little men and little women caught at an age between childhood and adulthood. It is a time in their life when they bear an ethereal and tender quality - something that has been most typically and historically assigned to adolescents, but rarely to young people of color. 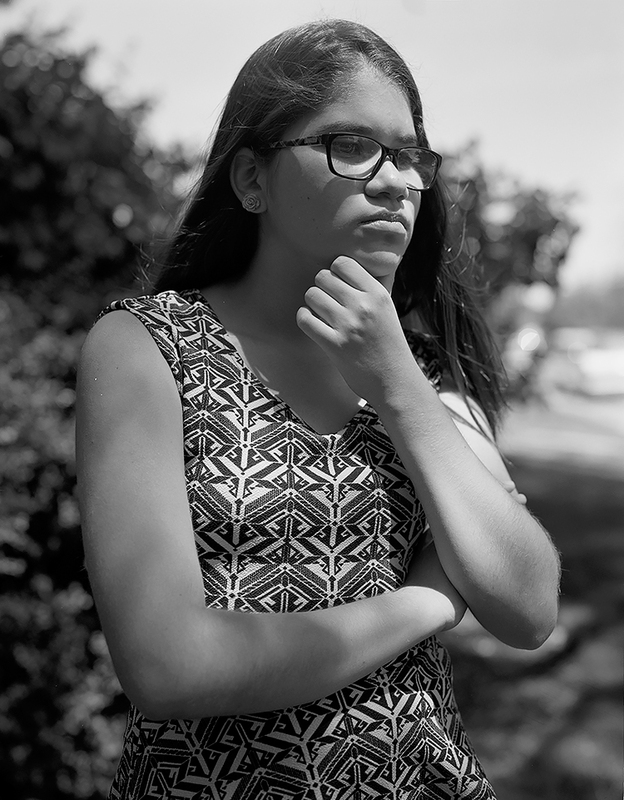 Her motivation for this project was to represent these hombrecitos and mujercitas in a manner that belies the stereotyping of Latinos, and to exemplify the impressionability and vulnerability that characterize adolescence. As hombrecitos and mujercitas face the complexities and social realities of race, gender, and class, their susceptibility is especially poignant; any misgivings we hold as a society about these young men and women not only shape our public perception of Latinos, but ultimately affect the way that young Latino men and women view and shape themselves as they enter adulthood. 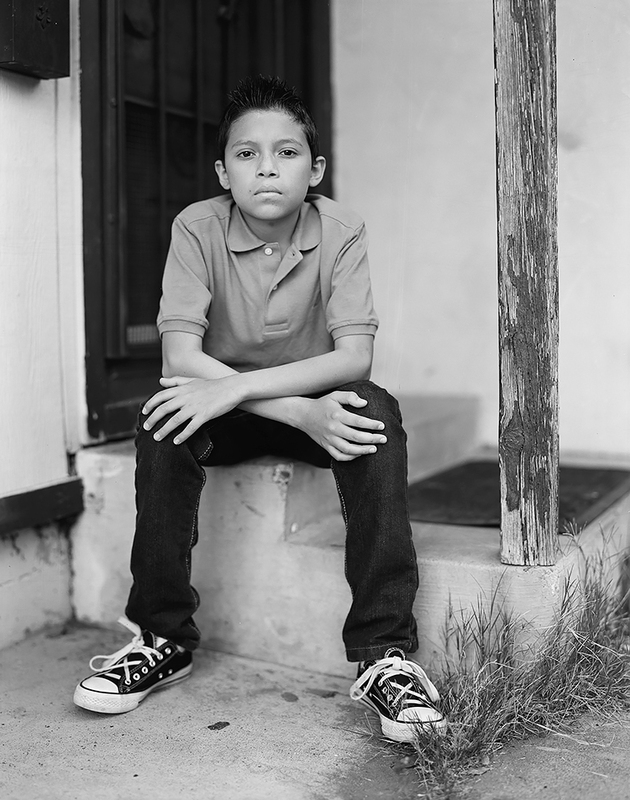 The children in these portraits are recent immigrants, from countries such as El Salvador, Colombia and Mexico. Or, like Landeros herself, they are first generation born to immigrant parents. So, they are not only straddling the worlds of childhood and adulthood but also of two cultures. Landeros has also included portraits of her family, who served as the inspiration for this project. Hombrecitos & Mujercitas is a timely and moving project, both personal and political, pulled directly from Landeros' experience growing up in this country and watching her nephews navigate the rights of passage into adulthood. Kari Orvik has also been lugging around a large format view camera to make her photographs. 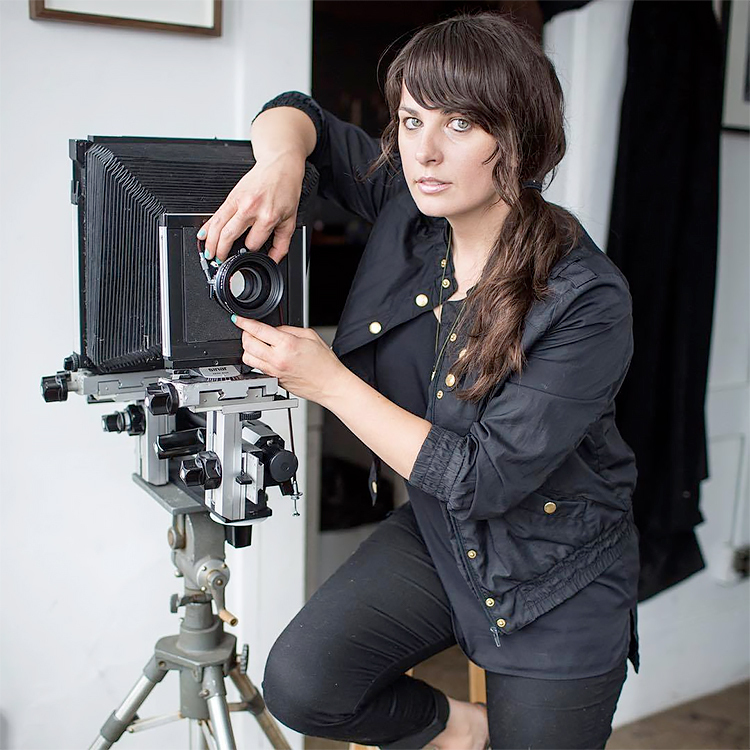 Like Landeros, Orvik has been shooting film, but she has also been utilizing the historic wet plate collodion process, to make both ambrotypes and tintypes. In San Francisco, a city that is in a constant state of transformation, the present is almost as unreliable as the future. There is no guarantee that what you see, hear, smell and feel as you make your way through neighborhood to neighborhood will be the same from one day to the next. 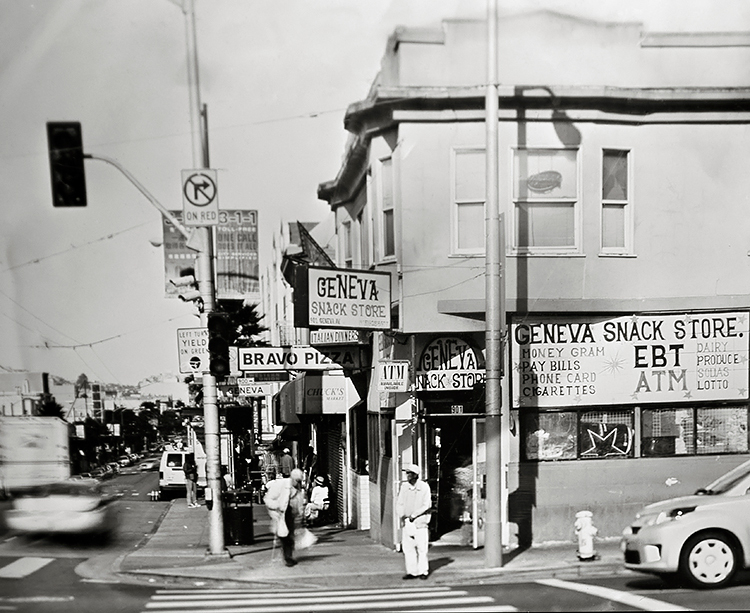 Orvik's current series, Geneva, is a time-sensitive personal inquiry at the intersection of Geneva Avenue and Mission Street in San Francisco's Excelsior district. This corner is the location of Orvik's tintype portrait studio. Over the past year she has begun to build relationships with longtime family business owners, residents who work, live and pass through this bustling intersection, in order to create a document of change...and presence. These exposures are made on the street as well as in the studio. Orvik recognizes that her studio's location is also a part of this neighborhood's impending transformation. For the past 9 years she has incorporated the historical photographic process of wet plate collodion into her work as a way of understanding the changes to the environment around her. The physical nature of this handmade process and its visual allusions to the past offer a different palette of photographic possibilities to look at memory and change over time in a city that never stays the same. Stop by RayKo Photo Center during the opening reception on December 9th to view both of these investigative projects and meet the artists to discuss their journeys and discoveries. A six-month residency is not long enough to tell the full story of what has transpired in San Francisco and Sacramento, but it is a telling period in the lives of both of these artists and both of theses regions. 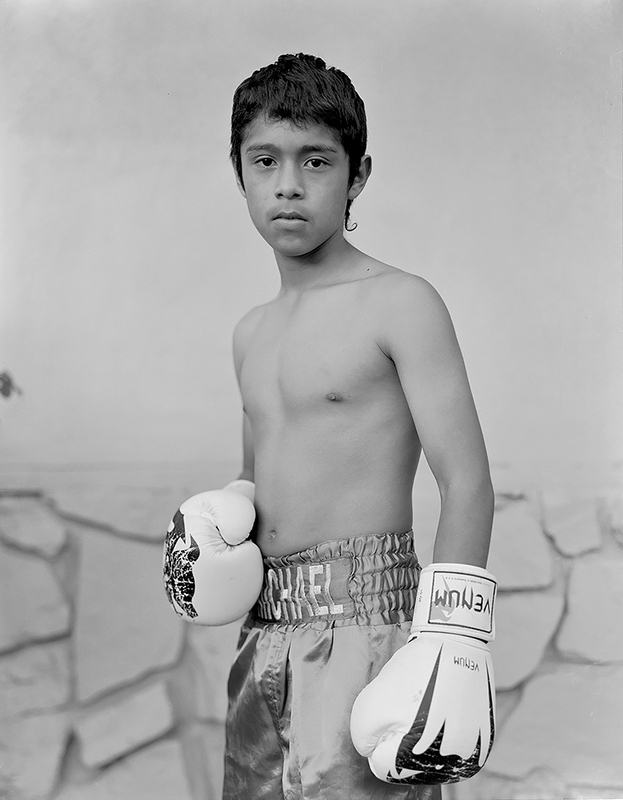 Kathya Maria Landeros is a photographer and educator who lives and works from her hometown of Sacramento, California. Her photographic work is informed by her bi-cultural upbringing and often explores Mexican-American identity and the immigrant experience. For over a decade, she has worked on long-term personal projects documenting Latino communities throughout California's northern Central Valley and other parts of the American West. The recipient of a Fulbright Fellowship, she has also photographed and lived in Mexico. She currently serves as a Fulbright Ambassador. Prior to earning a graduate degree in photography from Massachusetts College of Art and Design, she received an undergraduate degree in English literature and Hispanic studies from Vassar College. Kari Orvik moved to the Bay Area from Alaska and became a photographer while working in affordable housing in San Francisco. 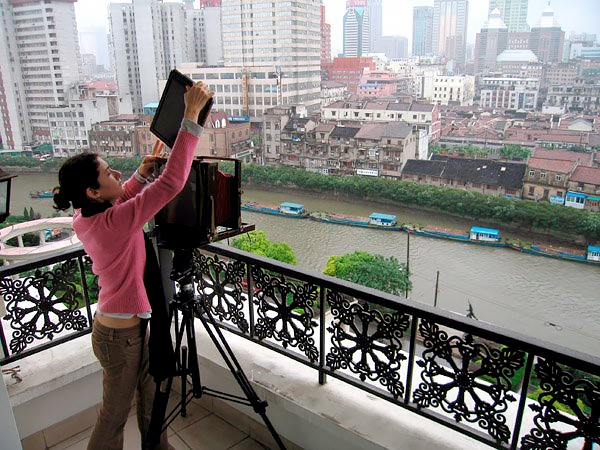 She has set up public portrait studios in SRO's, BART plazas, and on rooftops in the Mission. Her work focuses on memory and change over time, which she explores through the historical photographic process of tintypes. 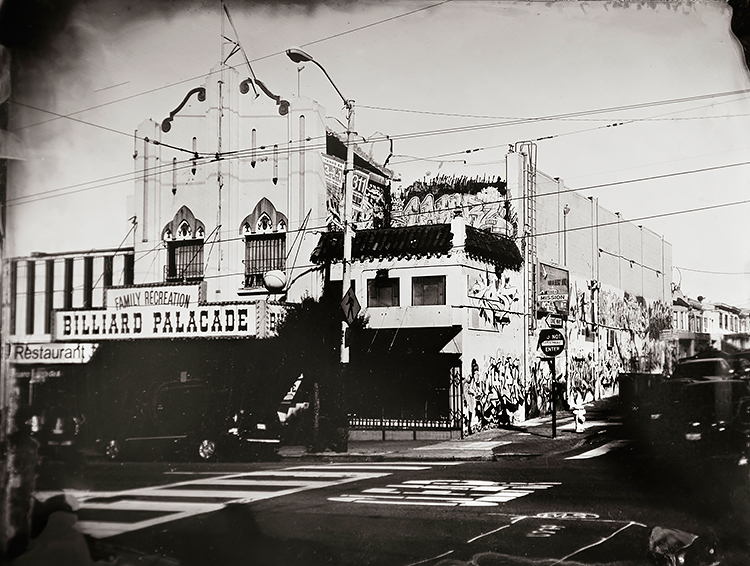 From a portable darkroom she makes long-exposure tintypes of urban landscapes that document time passing in ever-changing San Francisco neighborhoods. She also employs this process for her personal narrative project "Exercises for Moving in Between", much of which was completed at the Headlands Center for the Arts, where she was a graduate fellow. Her work has been featured on the cover of San Francisco Magazine, in exhibitions at SF Camerawork and the Headlands Center for the Arts. A graduate of Stanford University, she received her MFA at UC Berkeley, and grants through the San Francisco Foundation's Murphy and Cadogan Fellowship and the San Francisco Arts Commission. 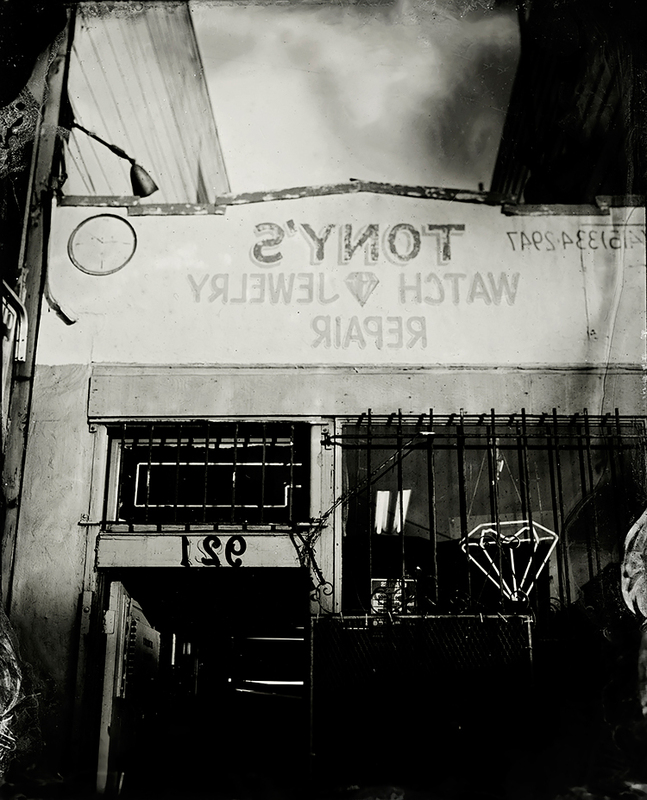 A former studio photographer at Photobooth SF, she currently operates her own tintype portrait studio in San Francisco kariorviktintypestudio.com. RayKo Photo Center & Gallery is a comprehensive photographic facility, located near the Yerba Buena Arts District, with resources for anyone with a passion for photography. 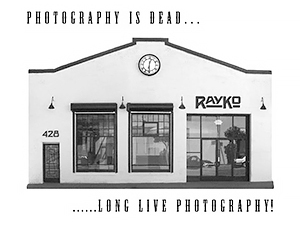 Established in the early 1990's, RayKo Photo Center has grown to become one of San Francisco's most beloved photography darkroom spaces; it includes traditional b&w, color and alternative process labs as well as a state-of-the-art digital department, a professional rental studio, galleries, and the Photographer's Marketplace - a retail space promoting the work of regional artists. RayKo also has San Francisco's 1st Art*O*Mat vending machine and a vintage 1947 black & white Auto-Photo Booth and a retail store that sells all types of used film cameras, from view cameras to Leicas to a build-your-own Nikon station. Everything you need to make any type of photograph! RayKo Gallery serves to advance public appreciation of photography and create opportunities for regional, national and international artists to create and present their work. RayKo Gallery offers 1600 square feet of exhibition space and the Photographer's Marketplace, which encourages the collection of artwork by making it accessible to collectors of all levels. RayKo also has an artist-in-residence program to further support artists in the development of their photographic projects and ideas.